What a good (and big!) question! 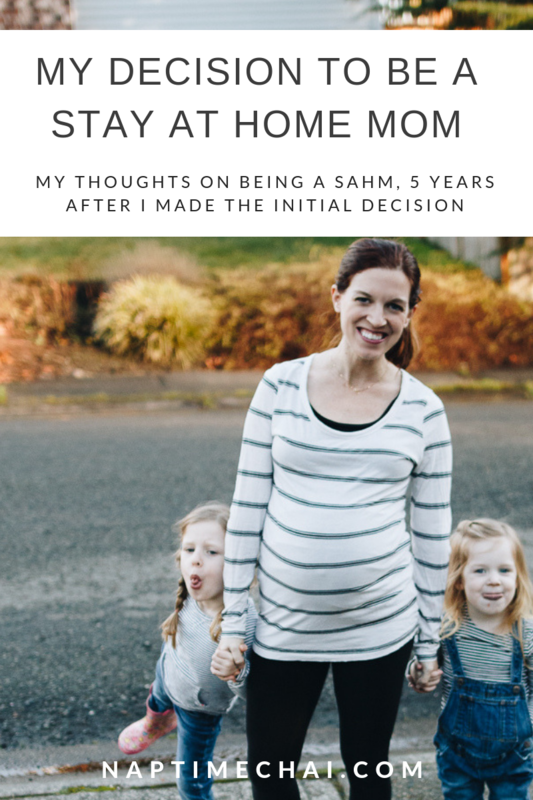 Five years ago I wrote a post about my initial decision to be a SAHM, so that explains how it all started. (*Spoiler: I did not leave my job to stay at home. My job left me and I didn’t find a new one! *) But let me catch you up a little bit on why I’m still a SAHM, 5 years later, in case any of you are wondering the same thing, or find yourself in a similar situation with your own family. The number one reason I stay at home with my girls (full-time) is simply because Tim and I think it’s important. We both feel strongly about having our kids home with one of us, most of the time, at this baby/toddler stage. Since I made less money than him when I was pregnant with Clara, we decided that he would work and I would manage the household and watch the girls. (*Sidenote: when I say ‘manage the household’ I mean keep track of what is going on. I do not mean I do all of the housework – Tim and I attempt to split that as best we can.) He, of course, would have also been supportive of me going back to work if that’s what I wanted to do, but we value the flexibility of me staying at home with the girls. Honestly, I never thought I’d be a SAHM for this long, but… life has just happened! I always wanted to go back to work when Clara was about 2 years old, but at that time I had another newborn… Isabelle! So then I wanted to give her a full 2 years with me. And then shortly after those two years passed, I found out I was pregnant again with Baby #3! It is the plan, however, for me to go back to work this fall, when Baby #3 is about 6 months old. Ideally I want to find a part-time, work from home role… which I think may be like trying to find a unicorn. We’ll see if it happens. The thing is, once Isabelle turned 2, I started to feel like my value at home has been diminishing, and now I’m certain that both girls would actually do even better under someone else’s care for at least some days per week. And I know that I would appreciate the mental and physical break of being away from my kids. + The job search. I have tried to find part-time jobs quite a few times over the years, and it’s been difficult (impossible) to find the time to update my resume, fill out online applications, and interview with all of my other ‘mom’ responsibilities. I would really need to hire part-time, consistent help just to be able to find a job. Would it be worth it to hire someone while I job search? Possibly… but it’s also a huge, and expensive, hassle, that could go on forever! If a job had just fallen into my lap, I would have taken it! +Money. I would not go back to work full-time, so I’m only looking for a flexible, part time position… which is hard to find! It’s especially hard to find when I need to make enough money to cover childcare (super expensive in Seattle, especially with two kids! ), taxes, and commuting costs. It’s not worth it to me to go back to work to make essentially $0 (or less!) per year, so my options are pretty limited. Childcare is just too darn expensive, especially for three kids, two of whom are also in preschool (which is also very expensive)! + Logistics. I know working moms do this all of the time, but if I were to find a job, it seems incredibly daunting to arrange childcare, get out of the house in the morning, figure out sick days and appointments and activities and all of the things. Not to mention, who is going to manage most of the house stuff if I’m working?! Although, this last point has become a bit moot over time, because I have zero time to get anything done at home with two non-nappers. I think I’d actually be able to accomplish more house-managing at work! + Maternity leave. I thought about trying to find a job early in this pregnancy, and then I thought about maternity leave and realized there is absolutely no way I’d want to go back to work a few short weeks after having a baby. I was a mess for YEARS after Isabelle was born, and I just don’t have enough energy to do it all in such a short amount of time after having a baby. Plus, pumping at work? Nope. That sounds awful (and I applaud you moms who do it! ), especially in the first few months. I’m at the point now where I know it’s time for me to transition into a working mom, but I am still waiting to have this baby and then to spend some time at home with him/her! Ideally, in the fall I will find a part-time, work from home role that allows me to be a present mom, pay for childcare, and use my brain in some different ways. Now what this role will be… I have no idea! Will I use my CPA (for once)? Will I go back into being a project manager or business analyst? Will I do more low-key accounting – like bookkeeping? Or will I do something completely different?! Time will tell. I’ll be praying about it and I just know God will guide me to the perfect role. Deciding to be a SAHM has felt like a deeply personal and complicated decision, while also seeming like it really wasn’t a decision at all so much as a state of being that I haven’t had the energy / resources to change. The past five years have just flown by. Whenever I wonder if this is the best choice for me and my family, I conclude that it has been. This is a season. It feels long (and thankless, to be honest!) right now, but I know I will look back on it as a gift. I wish that I absolutely loved all aspects of being a SAHM and that I found it ‘easy’ and that it would fulfill me in every way and that I saw it as my ‘dream job’, but it just doesn’t feel that way. That doesn’t mean that I don’t appreciate being able to do it, though. Now I just have to remember that this is a gift as I welcome our third baby to the family and adjust to being a SAHM for three kids under five years old! This entry was posted in about me, motherhood and tagged motherhood, SAHM. Bookmark the permalink.